You can assign work packages to your project team members and determine the distribution of work. The procedure of assigning work packages is the same for activities, milestones and summary activities - all features can be found in the dialog box New or Edit of each planning item. Click planning element in the planning list you want to edit and then click Edit in the Edit group. Right-click planning element in the planning list and click Edit in the context menu. Double-click a planning element in the planning list . 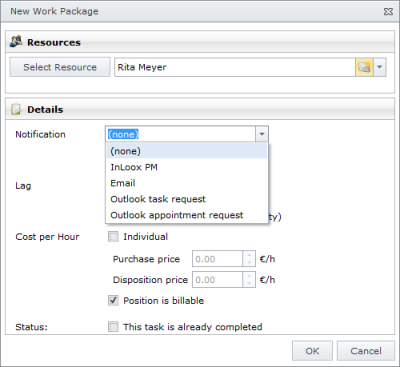 In the New Work Package dialog box, in the Resource area, click Select resource. Use the quick selection to add a new resource. Click the Arrow . You can see in the drop-down list all resources that have been added to the project. In the Address Book dialog box choose one address book from the Address book drop-down list and choose the needed contact from the list. In this dialog box you can also add a new contact by clicking Contact. For more information on how to create a new contact, see Add a contact. On the Edit dialog box, in the Name list, the new name will be displayed. In the New work package dialog box сhoose the notification type from the Notification drop-down list. The notification determines when and how an added resource will be informed about the details of this work package. Choose one of the following: (none), InLoox PM, Email, Outlook task request, Outlook appointment request. Change the workload of the resource (optionally) in the Workload area. You will see the workload of the resource in percent (%) during the defined time period. Select the Individual check box in the Cost per Hour area and set an individual hourly rate for the resources, if you want to ignore the group cost rate. Type the respective values in the Purchase price and in the Selling price field. The Is asset billable check box is selected automatically to include the resource costs of this work package to the expenses (plan, resources). Select the This task is already completed check box in the Status area. The status shows, whether the particular resource has completed his/her task. In the New Activity / New Milestone or the Edit Activity / Edit Milestone dialog box, on the Resource tab, choose the resource's name from the Name list. Click Edit and make your entries in the dialog box. In the New Activity / New Milestone or the Edit Activity / Edit Milestone dialog box, on the Resource tab, choose the resource's name from the Name list you want to remove. Check the resource capacity utilization with the resource central overview. For more information see the chapter Resources. Inform via email the project team members about e.g. project status. Click email icon right to the Select resource field after you have added a contact there. For more information see Select project team members, in a Send an email message section. Add resources - InLoox • Copyright 1999-2019 © InLoox GmbH. Tutti i diritti riservati.